No matter how old you get, seeing the doctor pull out a giant hypodermic needle and aim it at you is enough to give anyone the temporary terrors. The medical community has been working on alternative delivery methods for medicines for quite a while now, and it looks like microneedles are the front-runners. 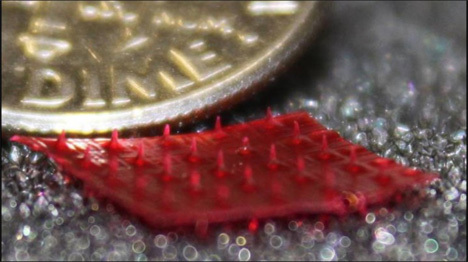 These painless little patches of tiny needles deliver medicines as easily as putting on an adhesive bandage, leaving behind none of the hazardous bio-waste created by hypodermic needles. A research team at Tufts University has taken the microneedle concept and moved it one step further by creating the tiny needles out of a type of silk. According to the bioengineers behind the project, it can be very difficult to manufacture effective microneedles with current procedures. The pharmaceuticals meant to be delivered by the system can often be destroyed by harsh manufacturing conditions and then fail to be released in the patient’s body in a controlled and effective way. 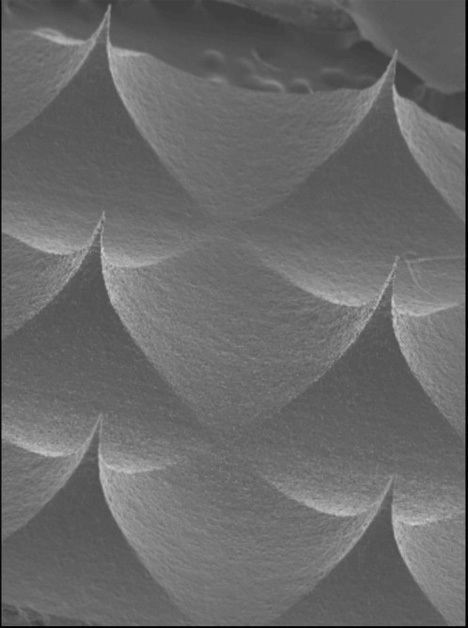 But the biomaterial silk fibroin is an ideal answer to these problems, offering an easy way to alter the rate of delivery and lowering the risk of infection (over conventional microneedle production methods). One huge benefit microneedles have over traditional hypodermic needle-delivered drugs is that they don’t require refrigeration, making them more stable for delivery to remote areas.